I was thinking about how to describe this cleanser to you, but I think this says it all: coconut milk! It’s creamy, delicious skincare… and, when you feel like your skin needs something extra special and nourishing – this is like the best kind of comfort food. It’s my vegan Coco Mylk Powder Cleanser & Mask and I can’t wait to show you!! I developed this vegan friendly recipe for a workshop last year – and it’s one of my favorites to teach! 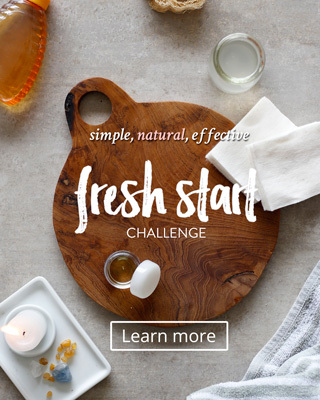 It can be a swap for my Honey Cleanser from the Fresh Start plan, if you were looking for an alternative, this is the recipe for you! This a really good face cleanser for all skin types! And the simplicity of the recipe makes it extra special – this is a powdered cleanser – and that means you don’t have to worry about it going off. Yes!! Make it once, and it will last for up to three months in air-tight jar! When you want to use it – you simply mix a scoop of Coco Mylk Powder Cleanser with a bit of water to form a creamy consistency – and to activate the ingredients. Oat Flour: A natural cleanser for your whole body, oats have saponins which help to release dirt and oil from your skin. When oats come in contact with water, it releases this silky gel that is ultra nourishing, protective and very soothing for your skin. Coconut Milk Powder: Full of fatty emollients that leave your skin plump and moisturised. 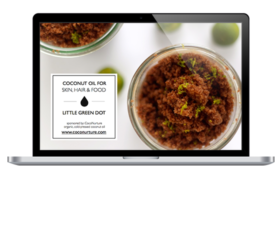 What’s really special about the fat in coconut milk is that’s its super high in lauric acid – which has incredible antibacterial properties and helps keep your skin stay clean and clear. Vegan friends, I’ve noticed that many coconut milk powders are mixed with dairy milk – so do check for that. *click here* for a vegan option. Cane Sugar: Made from dehydrated cane juice, it’s rich in natural glycolic acids (AHA – the expensive stuff in jars!) It eats away at clogged pores and dead skin cells and gently removes the build-up that dulls our complexion, so that you see your own stunning glow shine through! Most sugar is processed and stripped of these benefits – so to make really good skincare – keep your eyes open for “evaporated cane juice.” *click here* to see an example. I used to make this just as a face cleanser – but now I make a big batch and use it for my entire body. It’s feels so luxurious! A really good idea is to prepare your cleanser, go into the shower and wet your skin, then turn off the water and massage it all over head-to-toe. It envelopes you, cleans your skin beautifully and makes you feel… lovely. moisturising daily face and body cleanser – or leave it on as a mask! Mix all the powdered ingredients together, in an airtight jar. To use for your face, scoop out 1 tbsp of the powdered mix into a small bowl or container. Blend in droplets of hot water to form a creamy consistency, let it sit for a few minutes for the ingredients to activate. To use as a full body cleanser, scoop out 1/4 cup and mix with droplets of water to form a creamy cleanser. When you can, leave it on your skin for 10 minutes for a mask and deeper treatment. I would love to try this! Do you know if I can use other kinds of sugar, such as turbinado or sucanat, or even coconut sugar? Thank you for this lovely recipe. Where can we get the coconut powder in Singapore?